Firstly, register an account to get your Stripe secret key and Stripe public key. Secondly, go to your dashboard to Enable Stripe payment method. Then, enter your Stripe secret key and Stripe public key. Choose the Stripe gateway by clicking “Select” button. After that, there will be a pop - up form for users to input their card information. 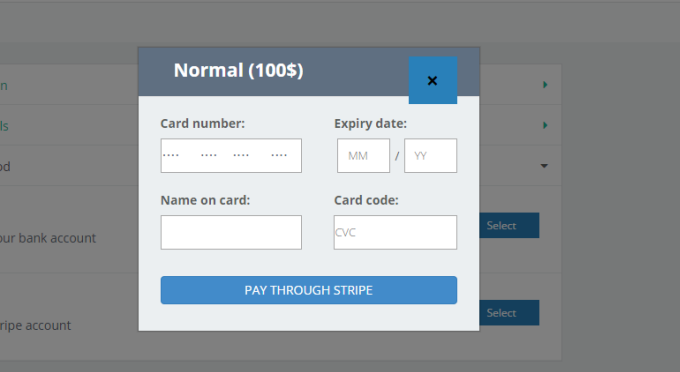 After completing all the fields, click “Pay Through Stripe” button. A form will automatically send the request to server stripe.com and user will be received a responsive notification.